Established in 1660, the Granary is notable as the resting place of BostonÂ’s most famous sons. Named for the 12,000 bushel grain storage building that was next door, the graveyard has 2,345 markers. Some say as a many as 8,000 people were buried here. The InfantÂ’s Tomb #203 where an estimated 500 children have been interred is located near the central obelisk that marks the graves of Benjamin FranklinÂ’s parents. Alongside the far wall to the southwest is the elaborately embellished marker of John HancockÂ’s tomb. Toward the rear Paul Revere is buried; a larger marker placed in the 19th Century stands by a small slate marker that dates from RevereÂ’s burial. 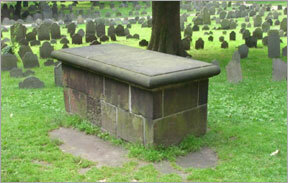 Bookend monuments in the two front corners of the burial ground represent patriots James Otis and Samuel Adams. Sam Adams had the Boston Massacre victims interred in his family tomb, and so beside the marker of that tomb is one for the victims: Crispus Attucks, Samuel Gray, Samuel Maverick, James Caldwell, and Patrick Carr. On the right hand wall is a plaque marking the tomb of Robert Treat Paine. He along with Sam Adams and John Hancock brings the number of signers of the Declaration of Independence buried in Granary to three. Granary란 한 나라의 주식을 대량으로 생산하여 공급하는 곡물생산지대를 말합니다. 보스턴 최초의 곡물창고에서 가까운 거리에 있어서 '그래너리'라는 이름으로 불리게 된 묘지인데 메사추세츠주 초대 주지사이자 독립선언서에 이름을 남긴 존 핸콕과 영국군과의 전투에서 승리를 했던 폴 리비아, 독립전쟁을 이끌었던 제임스 오티스와 새뮤얼 애덤스와 같은 미국의 자유와 독립을 위해 싸웠던 애국자들과 1770년에 일어났던 보스턴 학살사건의 희생자들도 이곳에 잠들어 있습니다. 그리고 벤저민 프랭클린의 양친의 묘도 이곳에 있습니다.